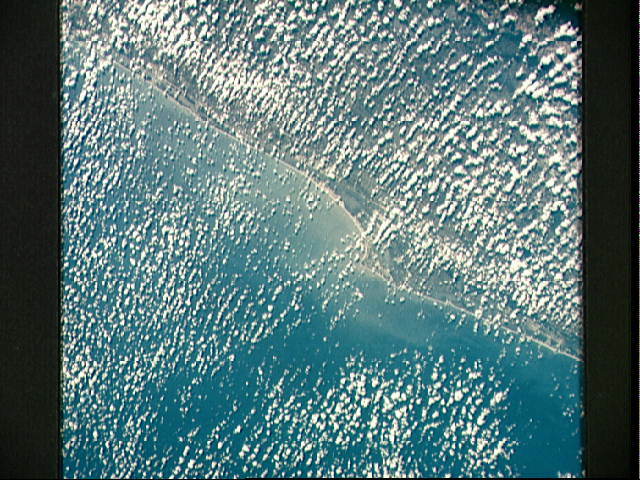 Atlantic coastline of Florida from Daytona Beach southward to Palm Beach area, as seen from the Apollo 7 spacecraft during its 17th revolution of the earth. Photographed from an altitude of 123 nautical miles, at ground elapsed time of 27 hours and 12 minutes. Cape Kennedy area is in center of picture. Small cumulus cloud puffs cover part of the Kennedy Space Center's Launch Complex 39, although the Vehicle Assembly Building and crawlerways can be seen. The city of Orlando, some 50 miles inland from Cape Kennedy, is also in the photograph.